Ho Chi Minh and his close circle of associates – namely, Le Duan, Truong Chinh, Pham Van Dong, Le Duc Tho and Vo Nguyen Giap—fresh off a grueling, hard-fought, victory to end foreign colonial rule– understandably felt strongly that they should have been awarded control of all of Vietnam. After all, they had led the resistance and the victorious war against the French. Yet the battlefield victories came mostly in the North, in Tonkin and Annam. The French on the other hand continued to maintain a significant presence in the southern half of the country. Saigon, Michelin rubber plantations and Mekong Delta rice represented the real economic engine in Vietnam. A lucrative enterprise to say the least. As a result the French, with help from their American backers, were able to resist a complete Vietminh takeover. 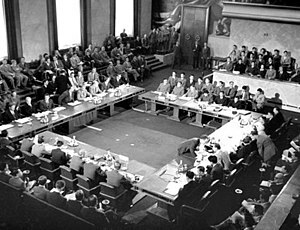 This was the situation in late spring 1954 when the world powers convened in Geneva to hammer out a settlement. The United States was not listed as one of the official signatory parties at Geneva. Instead, we had observers in place. Our senior observer was General Walter Bedell Smith, General Dwight Eisenhower’s former chief of staff. Smith wasn’t necessarily intransigent but he was clearly constrained by the Cold War spirit of anti-communism, exemplified in the strongly combative statements of Secretary of State John Foster Dulles. Clearly the Eisenhower government felt it had a stake in what happened at Geneva. And even though the Americans were not a direct party to the settlement they did heavily influence the final outcome. Probably for the worse as it turned out. The agreement was among Cambodia, the Democratic Republic of Vietnam, France, Laos, the People’s Republic of China, the State of Vietnam, the Soviet Union, and the United Kingdom. The United States took note and acknowledged that the agreement existed but refused to sign it to avoid being legally bound to it. As it happened, the definition of “free” elections became Diem’s out when it came time to have those elections. In 1956 he would claim that a nation-wide election was unrealistic, that it would be marred by intimidation and corruption on the Communist side and as such could not be trusted as being “free.” This from a man who one year earlier had gained power in a rigged referendum (to be discussed momentarily). With his influential American backers providing political cover, Diem’s refusal to participate worked. Or did it? The Geneva Accords “temporarily” divided Vietnam at the 17th Parallel. Why such a disappointing outcome for Ho Chi Minh and his comrades? At the time Ho’s primary allies, the USSR and the People’s Republic of China (PRC), had other geopolitical considerations that outweighed any benefits to be gained from digging in their heels for Ho Chi Minh. In the USSR, Stalin was dead and the struggle for control of the Party was in play. His eventual successor, Nikita Krushchev, was still emerging as leader. This was a very tense period of the Cold War; the Red Scare was still running rampant in America; the USSR was in a period of sustained industrial growth and was in the process of building its first generation of nuclear arms; most eyes were on Europe, the focus was on Berlin and consolidating Soviet rule “behind the Iron Curtain.” And even though the Vietminh victory over France represented maybe the greatest single success of a communist inspired insurgency since 1917, the full unification of Vietnam under Ho’s leadership was a secondary matter in Moscow. In addition, the Korean War was fresh in the memory. There the Cold War had turned hot, quickly flaring out of control, both sides backing-up proxy armies with the threat of nuclear weapons. After three bloody years the war ground to a standstill with no clear winners, and plenty of losers. After WWII and Korea, the super powers wanted a break from fighting. Although not yet easily apparent at Geneva, the Krushchev led USSR was beginning to move toward a policy of greater openness with the West. The Korean War was an unexpected and unwelcome development for Mao and his CCP. Coming as it did so shortly after victory over Chiang Kai-shek in the Chinese Civil War (1949), the Korean War postponed Mao’s effort to consolidate Communist rule over the vast country. He was also forced to break off plans to pursue and eliminate Chiang and his Kuomintang Army once and for all, having to send his armies to Manchuria to fight Americans instead. The Chinese Communists were also lobbying, primarily against US objections, to be recognized at the UN as the sole representatives of China. Chiang Kai-shek had escaped to Formosa (Taiwan) and was being backed by the West in the UN and protected by the US under threat of nuclear retaliation. Throw in the fact that much of China lay in ruins after years of civil and world wars and it becomes clear that Mao’s delegates in Geneva, led by Zhou Enlai, weren’t going to go out on a diplomatic limb to strengthen Ho Chi Minh’s hand. More than anything else, the Chinese Communists needed time to rebuild their own country before focusing on building Ho’s. With the Geneva Accords completed the U.S. replaced the French as the political and military benefactor in South Vietnam. In the wake of the French withdrawal, within a year after Geneva, in a bold move aimed at consolidating power, Ngo Dinh Diem, then the fledgling Prime Minister under Bao Dai, staged the October 23, 1955 Plebiscite rigged by his brother Ngo Dinh Nhu to unseat Bao. Almost comically, Diem came away with 98% of the vote in South Vietnam, with 133% in Saigon. Then, as discussed earlier, Diem refused to hold the national elections in 1956, noting that the State of Vietnam never signed the Geneva Accords. He then went about attempting to crush communist opposition. In fact, both sides violated provisions of the Accords, with both regimes engaging in military buildups in direct violation. Northern inspired guerrilla activity in the South escalated, while U.S. military advisers continued to support and train the Army of the Republic of Vietnam (ARVN). It took until 1975 for Ho Chi Minh’s followers to accomplish, through force of arms, with millions of casualties, what could have been settled in Geneva in 1954. But it was not to be. The lesson learned by Ho Chi Minh and his men was that costly victories on the battlefield could be squandered at the treaty table. They would never let it happen again. Just ask Henry Kissinger!